The Baby-Sitters Club series was a window into many different worlds while I was growing up. After all, it was through these books that the words “brittle diabetic” entered into my vocabulary and how I first learnt about diabetes. Stacey McGill’s life-altering condition was ever present and sensitively handled in the books; her best friend Claudia Kishi always ensured there were pretzels for her to snack on while the rest ate sugary American junk food at their club meetings. The Truth About Stacey is one of a number of books from the original series that’s been chosen for comic book adaptation. As the title suggests, the story focuses on the character of Stacey and we soon discover what her ‘truth’ is. As her estranged friend Laine shouts in the darkness of the movie theatre in one scene in the book, “You never even told me the truth about your… your sickness.” Their ensuing conversation clarifies misconceptions about diabetes (“thought you were contagious”) and solves the mysteries that shrouded the early days of her condition, which caused a rift between them. 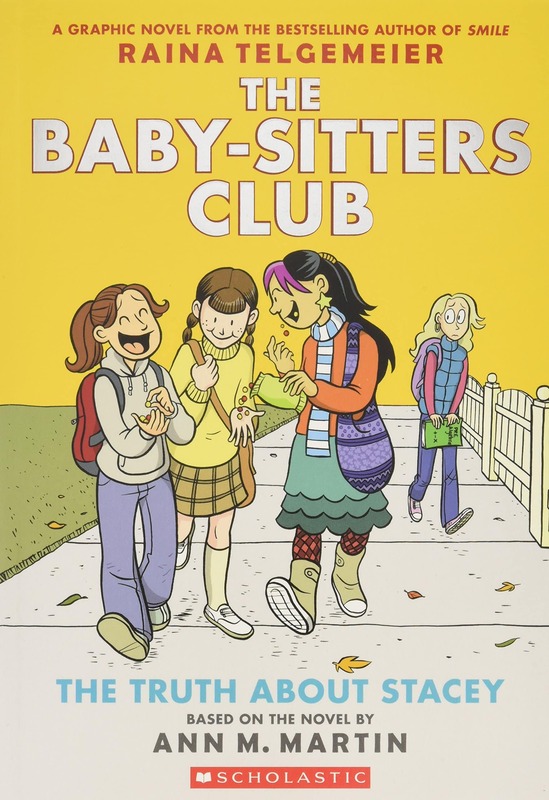 Raina Telgemeier artfully brings to life Ann M. Martin’s writing in a warm and approachable graphic style. Its strength is the ways in which it realises the perspectives of every young person, and it’s a dynamic depiction full of emotion and humour. The comic book features numerous plot lines in addition to the main one and each subplot is thematically connected. How can children assert themselves against those who are older and more powerful? The Baby-Sitters Club have difficulties with older girls trying to steal their business; meanwhile Stacey has to deal with overprotective parents who never allow her to have input into her care. However, in the world of these young women, not all adults are difficult to communicate with; just the adults closest to them. In direct contrast to her interactions with her parents, Stacey babysits a girl whose mother is a doctor, someone she can confide in about her parents and their quest for a miracle cure. Wide-eyed and anxious, Stacey begs, “Dr Johanssen, you have to help me!” The conversation raises a professional dilemma for Dr Johanssen as to the right course of action and how she might intervene, if indeed it is appropriate given she is unacquainted with Stacey’s parents and is not their family doctor. For Stacey, however, this conversation is the start of her understanding that in order to assert herself and have control over her care, she needs to be more proactive – perhaps these are her first real steps into (young) adulthood. In one of the last scenes of the book, Stacey acknowledges the role her parents have played in trying to secure the best care for her before handing them a referral letter from Dr Johanssen. It’s an action which catches them off guard. “I wish you’d discussed this with us before you made an appointment,” says her father. To which Stacey replies: “You make appointments for me without asking me first.” It ends up being an empowering experience for the whole family with a doctor that “even made my parents feel comfortable”. For the first time the parent-child roles are temporarily reversed. Dr Graham becomes another trusted adult who finally persuades her parents to change their behaviour. “What Stacey needs is some stability,” he says and her mother finally concedes, “Maybe… it’s time Stacey had more to say about her treatments”. The scene ends with Stacey beaming and shaking hands with Dr Graham. The Baby-Sitters Club was a mainstay of my own childhood and introduced many important concepts into my inchoate understanding of the world, which I was powerfully reminded of as I read this familiar story in comic form. I can only imagine how much more affirming it would be for a young woman struggling with diabetes. Through its graphic depiction of young adulthood with a chronic condition like diabetes, a useful resource with great emotional resonance has been created. Reading this comic book is an exercise in empathy for adults, and especially for parents.